Where was I during the Great Roasted Chickpea Craze of 2010? Google the phrase and you’ll find that apparently everyone was making them, or eating them, except me. But though I’m late to the party, I am happy to be here, because this is a delicious and easy snack. There seem to be two schools of thought about roasting chickpeas: you can dry roast them and then toss them with an herb or spice-infused oil, or you can roast them in a drizzle of oil with your flavorings. I looked through lots of recipes online and then came back to my bookshelf and used Mark Bittman’s recipe from How To Cook Everything Vegetarian, which I have (of course) adapted a bit myself. Put the oil in an ovenproof skillet big enough to hold all the chickpeas in a single layer, and heat over medium heat. 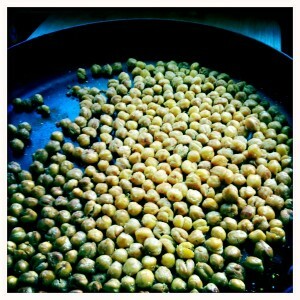 When hot, add the chickpeas and garlic and sprinkle with salt and pepper. 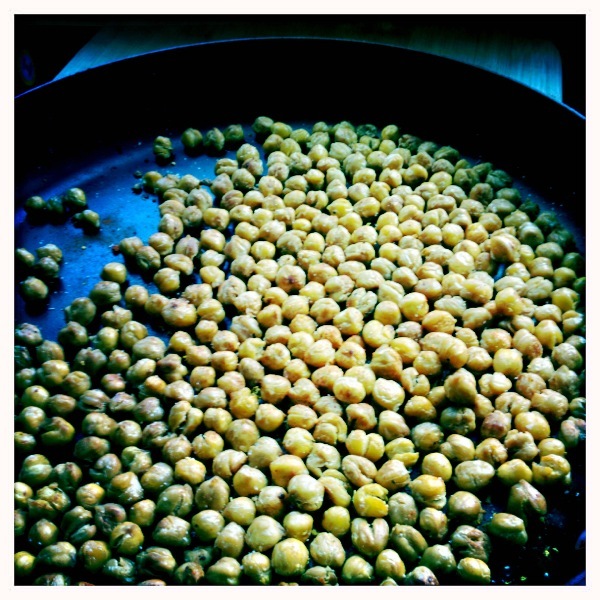 Shake the pan to coat the chickpeas well. Transfer the skillet to the oven and roast, shaking the pan periodically, until the chickpeas begin to brown (15-20 minutes). Take out of the oven and sprinkle with the lemon zest and smoked paprika. Cool slightly and serve.